Israel, Iran, Syria issues dominate President Obama’s address to the U.N.: Calls for diplomatic engagement with Iran, says US does not seek “regime change” in Iran. 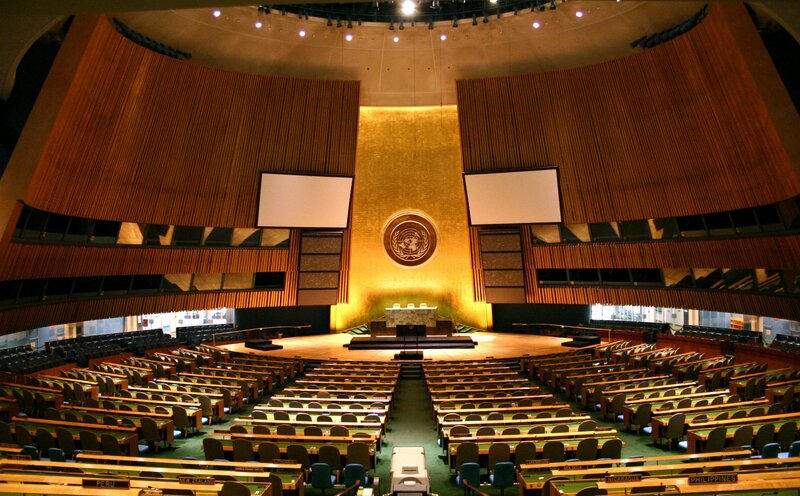 The UN General Assembly hall where the leaders of the world are now meeting. (Washington, D.C.) — President Obama’s speech to the United Nations General Assembly just concluded. It was scheduled to last 15 minutes. It went for at least 40 minutes. The issues in the Middle East — notably in Syria, Iran and Israel — dominated the American leader’s remarks. “Iraq showed us that democracy cannot simply be achieved by force, but rather that these objectives can better be achieved when we partner with the international community,” he said. In the short term, US foreign policy will focus on two issues: Iran’s “pursuit of nuclear weapons” and the Israeli-Palestinian conflict. Resolving these two key issues could help bring a broader peace. Resolving Iran’s nuclear issue could be a major step forward. America prefers to do so peacefully, but is determined to prevent the Iranian bomb. “We are not seeking regime change.” We respect Iran seeking peaceful nuclear energy. Iran must meet its obligations…..
On Israel and the Palestinians, Obama says he was inspired by young Israelis on his visit in March. “I believe there is a growing realization in Israel that the occupation of the West Bank is tearing the democratic fabric of their country.” But Israelis have the right to have their country recognized in bodies like the United Nations, and Israelis have the right to live in security. The Palestinians have the right to live in peace and security in their own sovereign state. Just as the Palestinians must not be displaced, the state of Israel is here to stay. The entire international community must get behind the pursuit of peace. Israel’s security as a Jewish democracy depends on the realization of a Palestinian state. Arab world has to recognize the imperative for a two state solution. A solution would help isolate and defeat extremists throughout the region. Breakthroughs on the Iran and Israeli-Palestinian issues would have a profound regional impact. WASHINGTON POST: “President Obama on Tuesday challenged the United Nations and its members to respond more actively to resolve the civil war in Syria, using the conflict as an example of the wider challenges facing the world five years into his White House tenure,” reported the Washington Post. Read President Obama’s speech at the U.N. General Assembly (as prepared for delivery), via the Washington Post. What is the “War of Gog & Magog”? Detailed study notes on Ezekiel 38 & 39. What is the future of Damascus? 24 pages of study notes on Isaiah 17 and Jeremiah 49. Answering those who dismiss Isaiah 17 & Jeremiah 49 regarding the future of Damascus.